A Calabria sailing itinerary takes you to the beautiful Aeolian Islands. They are also called the Lipari Islands and lie just north of Sicily in the Tyrrhenian Sea about 30 nautical miles from the base at the historic harbor of Tropea in the Calabria region of southern Italy. The cruising grounds blend chic ports of call such as Panarea Island, a favorite among the jet-setter crowd, with the quiet ambience of islands off the tourist track such as Salina. Swimming, snorkeling, and sunbathing on pristine beaches is a delight. Sightseeing tours of castles, fascinating archaeological sites, and historic waterfront villages are intriguing and educational. Browsing in eclectic boutiques where fashion is of the first order and dining in fine restaurants serving exquisitely prepared local cuisine is the essence of luxury. These are among the many pleasures of sailing in the Aeolian Islands, known for gentle winds and splendid anchorages. Tropea to Panarea Island - 40 nm. 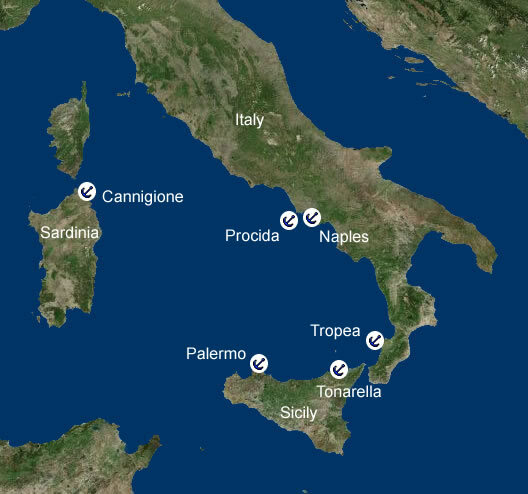 Your Calabria itinerary typically began the previous day, Saturday afternoon at 3:00 P.M., when you arrived at the base to check in, provision the boat (if you hadn't elected to have us do it for you), and receive your pre-cruise chart briefing. Now that you've enjoyed a restful night aboard, it's time to head out onto the shimmering Tyrrhenian Sea to your first port of call, lovely Panarea Island. Panarea is interesting for its exclusive boutiques, restaurants, nightclubs, and private villas. Its quiet streets and gorgeous beaches are picturesque and inviting. Exploring the archaeological site of Punta Milazzese, a Bronze Age village, is intriguing. There's a superb anchorage nearby just to the east. A delightful day stop on the way to Panarea is at the rocky island of Basiluuzo, where you can go ashore to check out the views and the ancient Roman ruins. Mooring: No moorings are available. Dockage is available at the pier at Contrada San Pietro or in front of club Raja. In an east wind (quite common in the early morning), these piers are unsafe. There's a beautiful overnight anchorage east of Punta Millazzese and another equally scenic anchorage at Cala Junco. Anchoring restrictions sometimes apply. It's best to check with the harbormaster or local tourist center prior to anchoring. Things to do: Apart from the fine dining, nightclubs, and beautiful beaches, one of the most fascinating attractions on Panarea are the ruins of a Bronze Age village at Punta Milazzese. You can stroll among the 23 oval stone huts and ponder what it must have been like to live on the island so long ago. La Spiaggetta is a great beach for snorkeling, swimming, and sunbathing. Panarea Island to Lipari Island - 10 nm. Continuing your sail south, the next port of call is at the largest of the Aeolian Islands. The heights are a mix of white from pumice, black from basalt, and green from the lush vegetation covering the slopes. It's truly spectacular as you sail along the coast. Ashore are five villages, each with its own eclectic mix of shops and restaurants. Breathtaking beaches are inviting for swimming, snorkeling, and sunbathing. Scuba diving is also fascinating on the various dive sites in and around Lipari. You can arrange for a guided diving excursion for all skill levels. Mooring: No moorings are available. The largest harbor in the Aeolians is Porto Lipari on the east side of the island, where you'll find dockage at the marinas as well as other amenities for yachts. The best anchorage is off the west and southwest side of the island between Le Formiche and Punta La Grotticelle. Things to do: At the north side of the main harbor is Monte Rosa, where there is a spectacular beach of white sand and pumice. Snorkeling is excellent at the anchorage between Le Formiche and Punta La Grotticelle. A stroll to view the Roman ruins near the monastery above Sotto Monastero is intriguing and educational, as is a visit to the Archaeological Museum with its exhibits, artifacts, and displays highlighting the fascinating history of the islands. 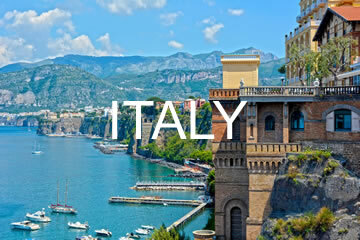 Touring the St. Bartholomew Cathedral and Plazza Mazzini's castle and monuments is also interesting and pleasant. There are more than 600 thermal springs on the island, as well as hiking trails in the mountains. Scuba diving and snorkeling is excellent in the area. Facilities: Fuel and water are available at Porto Lipari. Lipari Island to Vulcano Island - 2 nm. Your Calabria sailing itinerary takes you south once more on a very short passage to the appropriately named Vulcano. No fewer than three volcanic peaks rise from its interior, though only one is still showing evidence of activity, Fossa di Vulcano, which is famous for its hot springs. Thermal gardens are one of the main attractions on the island. They are renowned for their therapeutic properties. On Vulcano's south coast are magnificent beaches popular for swimming, snorkeling, and sunbathing. There are numerous bays with beautiful and secure anchorages. Mooring: No moorings are available. Vulcano's two bays are Porto di Levante and Porto di Ponente. Both are good anchorages depending on the wind direction. Things to do: The main town on the island is Vulcano and it has a wide variety of shops, restaurants, and bars. You can arrange for bus or taxicab tours inland to the village of Piano between the two peaks of Mt. Saraceno and La Sommata, and climb to the top of the extinct volcano of Gran Cratere to admire the splendid views and peer inside the deep crater. While not technically volcanically active, like some of its neighbors, Vulcano has its share of hot springs. The Laghetti di Fanghi mud baths and hot springs near Via Provinciale is one of the best thermal gardens on the island. There are excellent bays for snorkeling and swimming on the south side of the island between Punta dei Porci and Porto Bandiera, and between Punto Monaco and Testa Grosso on the northwest side of the island. Spiaggia Sabbie Nere (black-sand beach) is one of the best beaches in the Aeolians. Vulcano Island to Salina Island - 13 nm. Setting a course to the northwest past Lipari puts Salina Island dead ahead. You are in the midst of the Aeolian Islands, with the coast of Sicily astern. The deep blue sea sparkles with sunlight and a balmy breeze fills the sails. This is bareboat Calabria sailing at its very best. Salina is the second largest of the Aeolian Islands next to Lipari. In spite of its name, which derives from the salt works that were once an important part of the economy, the island could well be called a Garden of Eden. It's the only major island to have abundant water sources, which in turn has made it verdant and inviting. Renting a car, bicycle, or motor scooter is a charming way to see much of the island as you ride down picturesque roads in a place seemingly forgotten in time. Mooring: Moorings are available. There is good anchorage in Porto Santa Marina. Rinella, on the south side of the island, is a scenic and protected anchorage. As always, the choice of a specific anchorage for the night depends on the wind direction. Things to do: Salina is the second largest of the Aeolian Islands at 16 square miles, and savoring the delights of its winding roads and fantastic vistas from the summits of the volcanoes is well worth the expanse of renting a car, bicycle, or motor scooter for an inland tour. Taxi and bus service is also available. Hiking trails in the interior and along the beautiful beaches meander throughout the island, and they range from easy to difficult. The gardens and sanctuary of Madonna del Terzito is particularly beautiful. Pollara is the most spectacular beach on the island. Italian movie director Massimo Troisi filmed segments of The Postman there. Salina derived its name from the small salt lake on the southeastern end of the island called Lingua after the village of the same name. It was once a major salt works and makes for a pleasant walk with the nearby lighthouse adding to the nautical ambience. Facilities: Fuel and water are available at Porto Santa Marina. Salina Island to Stromboli Island - 21 nm. A pleasant passage to the northeast sets the stage for a wonderful day of sailing as you make your way to impressive Stromboli, the second largest active volcano in Europe besides Sicily's Mt. Etna. You'll see its prodigious heights and the smoke and steam at the summit well before you reach the small harbor of Ginostra, where you can anchor just outside and go ashore to explore and dine at one of the excellent restaurants. A guided tour of the volcano is highly recommended. Mooring: Moorings are available for a fee on the west side of Ginostra harbor. You can anchor in front of Ginostra for the day, but not for the night. The preferred overnight anchorage is south of Ginostra at Ficogrande. The water is quite deep. Make sure the anchor is well set and that you've let out sufficient scope on the anchor rode. Dinghy dockage: Dinghy dockage is available in Ginostra. Things to do: A visit to Stromboli wouldn't be complete without taking a guided tour of the volcano to see the impressive displays of Nature at work. Lava bubbles, steam hisses, and smoke rises around the crater. About a 30 minute walk from Ginostra is an observatory where you can admire Serra Vancori and enjoy a meal at the excellent restaurant there. There are also good black-sand beaches for swimming, snorkeling, and sunbathing, and trails for hiking. Strolling through the two villages to browse through the shops, have a delicious meal, or relax with a cool drink at one of the bars is a delight. Stomboli Island to Tropea - 30 nm. The final sail of your Calabria sailing itinerary takes you back to beautiful Tropea, where you can relax over an excellent meal in town after you arrive at the base by 5:00 P.M. to check out the boat. You'll bask in the sheer delights of the past week on the Tyrrhenian Sea. Mooring: No moorings are available. You can anchor just outside the harbor of Tropea. 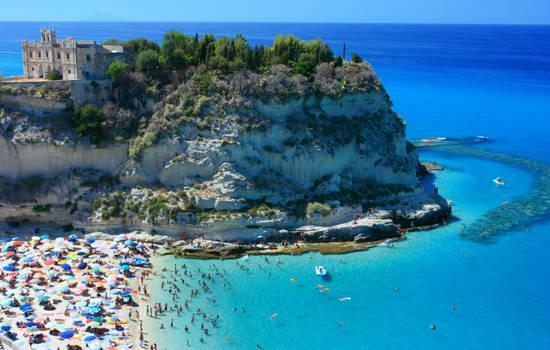 Things to do: Tropea is known for its magnificent white-sand beaches and rugged coastline and sheer cliffs. Swimming and sunbathing are popular pursuits. In the historic downtown district is the Porta Nuova, an opening above the sea at Piazza Galluppi with striking views of the cliffs and the beach below. Also perched on the cliff tops is the Chapel of Santa Maria dell'Isola. You can reach it via a winding path from the beach and stroll through the impressive edifice as well as the gardens that surround it. Fine restaurants, lively bars, and an eclectic mix of shops and boutiques are tastefully ensconced within the Old World traditional charm of Tropea, making it a delightful place to spend an afternoon and evening. Facilities : All facilities for yachts are available at the base.